I get a kick out of this happy little raccoon. He’s carried a pumpkin before, and now he’s carrying a heart. I used Sketch #197 at Operation Write Home Stars and Stamps. I colored the images with Copic markers. Lots of layers and clean lines. Thanks for stopping by today. 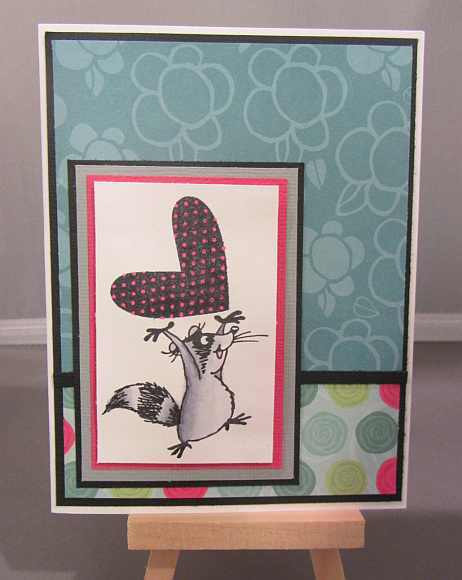 This entry was posted on Tuesday, November 5th, 2013 at 10:59 pm	and tagged with cardmaking, copics, Simon Says Stamp, stampendous, stamping and posted in Challenges, Love, OWH. You can follow any responses to this entry through the RSS 2.0 feed. I really like the paper – I especially like the image!